eBook 2: Wondering about The Hidden Secrets of BBQ. We've broken them down so you Get More From Every Barbecue. You will Achieve the BBQ Success you so desperately seek with this Best Selling BBQ EBook: The Little Known Hidden Secrets Of BBQ. We've often said BBQ is not Rocket Science but there is a process to this science. 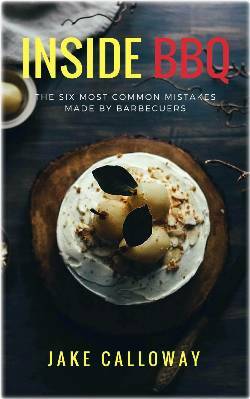 This eBook is focused on concrete tips that beginners and experts can use to improve their skills by employing these all too often forgotten barbecue tips. The best way to save time and money is to take the time to learn the techniques to shortcut the unnecessary processes. This eBook will help you do that saving time and effort. Cooking with charcoal lighter fluid can be good and bad. The lighter fluid will cause the food you are cooking to taste different than with other types of grills. However, attempting to not use lighter fluid may cause a lot of frustration due to the fact that charcoal can be difficult to light without lighter fluid. When you are lighting the charcoal for your Barbeque, be sure not to use lighter fluid to start the fire. The fluid is going to impart an awful smell and taste to your food. If you need to start a fire using lighter fluid, first cover the charcoals evenly with the fluid. Allow the fluid to soak into the surface layer of the charcoal so that the charcoals are not wet in appearance. This will protect you from immediate flame ups and charcoal fires that can spill out of the grill. If you over spray the charcoals and see puddles of the lighter fluid, allow the fluid to evaporate first before lighting the charcoals. One the charcoals are lit allow the charcoal to burn down until almost white in color. Secret: Did you know that Jake’s. Learn what many experts already know...The Little Known Hidden Secrets Of BBQ and move your BBQ to the next level. This eBook is a **DOWNLOAD**. Click add to cart then confirm the order with your delivery information and the eBook is cued for delivery.